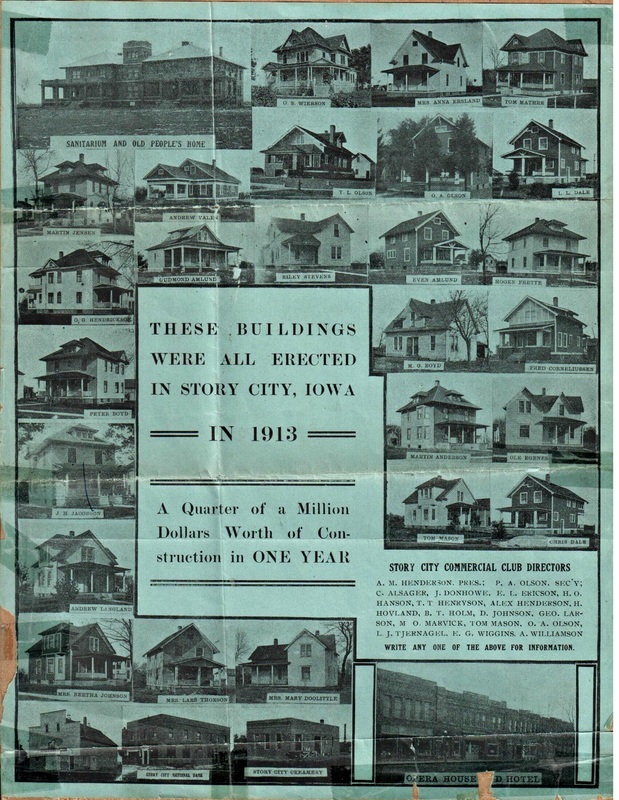 achievement within Story City, an advertisement was publicized by the Story City Commercial Club depicting the 25 homes and the 4 major commercial buildings that were erected. The advertisement was a pictorial display of the buildings and homes and listed the original owners of the properties. An original copy of this advertisement still exists after a century’s time, as do many of the homes and buildings that were built in 1913. Just as the advertisement celebrated the accomplishment of one year’s worth of construction, the Historical Society wanted to celebrate the architectural accomplishments that continue to be prevalent 100 years later. This online exhibit is a special project produced by the Story City Historical Society to retell the original story of the homes and buildings built in 1913. Because no addresses were provided on the original advertisement and many of the homes have been renovated or modified over the years, it was a challenge to see how many of the homes and buildings still existed. Much of the information was gathered by researching archived editions of the 1913 Herald newspapers. This online exhibit contains a copy of the original advertisement, a corresponding map of the current locations of the homes/buildings, pictures of the current homes/buildings, and any information found in the 1913 Heralds. The original advertisement publicized by the Story City Commercial Club.